The rise of nationalism in 2016 has brought about many political risks around the world. In the United States, the election of President Donald Trump has led to widespread concern over trade deals and escalated geopolitical tensions in places like North Korea. The United Kingdom’s ‘Brexit’ and talks of other member country’s leaving the economic common area have similarly led to concerns about the future of the European Union and Eurozone. By the end of 2017, Spain’s Catalonian independence movement has become one of the most pressing nationalist issues facing international investors in 2018 and beyond. One of the most prominent strains of the Catalan independence movement originated back in 1922, when Francesc Macià founded the Catalan State political party. In 1931, Macià proclaimed a Catalan Republic after negotiating autonomy with the Spanish state. The Spanish Civil War abolished the region’s autonomy in 1938, but the region regained its autonomy in 2006 after negotiating the Statute of Autonomy that was agreed upon by the Spanish government and passed by referendum in Catalonia. In 2010, the Constitutional Court of Spain ruled that some of the articles in the agreement were unconstitutional and others were more restrictively interpreted. Protests against the court’s decision quickly surfaced and demand for independence resurfaced for the first time since the 1920s. More than 500 municipalities held referendums between 2009 and 2011 and the Catalan government held its own referendum in November of 2014—all voting ‘yes’. 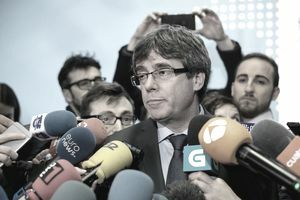 President Carles Puigdemont announced a binding referendum on independence that was deemed illegal by the Spanish government and the Constitutional Court. But, the vote was held on October 1, 2017 with 90 percent voting in favor of independence and a 43 percent turnout. The Parliament of Catalonia approved a resolution creating an independent republic on October 27, 2017, but the Spanish government intervened to stop it. Spanish Prime Minister Mariano Rajoy invoked emergency powers for the first time in Spain’s history, ousted the Catalan government, and imposed direct rule over the formerly autonomous region. He then called for new elections for the regional Parliament in hopes that Catalan voters would punish the secessionist leaders. Despite being held on a weekday, a coalition of pro-independence parties won again in late-December 2017 elections with nearly 80 percent voter turnout. However, results also showed a much more divided Catalonia, with the pro-union right-centre party Citizens becoming the largest elected party. The separation of Catalonia from Spain could plunge the region into a long period of uncertainty in much the same way as the ‘Brexit’, according to ING economists. The bank predicts that there would be a fall in consumption among Catalan households, which has already happened to an extent following the uncertainty. If the situation worsens, Catalan consumers could begin to panic and there could be a run on the banks and capital controls, which could spur more civil unrest. These concerns are part of the reason that the December 2017 vote was much more divided than the November 2014 referendum. Many Catalan businesses have already taken actions to insulate themselves from the crisis. More than 2,700 companies have already moved their corporate headquarters out of Catalonia, as of November 2017, and business investment has dried up. As of late 2017, economic data has shown rising unemployment, falling retail, and less tourism in the northeastern region of Spain following the independence vote. These declines could be just the beginning, however, with Spanish government officials indicated that unemployment could double in the region if it were to succeed in its separation. Spain could also suffer as Catalonia accounts for about 19 percent of the country's economic output, or roughly 224 billion euros, despite housing just 16 percent of the population. By comparison, that's a greater percentage contribution than California makes to the entirety of the United States. The lack of tax income from the region could reduce Spain's gross domestic product by two percent. The IMF has already reduced its outlook for Spain's economy in 2018, in part due to the Catalan independence movement, by 0.1 percent at a time when most of Europe experienced upgraded economic forecasts. Finally, Catalan companies exporting to the European Union could experience the biggest problems if the region were to separate from Spain, since the EU accounts for about 65 percent of exports and 70 percent of foreign investment over the past three years. If Catalonia leaves Spain, it would also have to leave the European Union, which could reignite problems in the regional economy. The EU has clearly indicated that it would not accept Catalan independence at this point, especially given the growing anti-EU sentiment in many other member countries. After all, the last thing that the EU wants is to encourage other countries to consider separating from the regional economy. The 'Brexit' has already stoked these concerns and Catalonia's exit could do more of the same and serve to further divide the regional economy. Then, there’s the issue of rebuilding the Catalan Republic. ING economists believe that the total economic cost of building the new country could actually exceed that of the ‘Brexit’ for the United Kingdom. Many of the region’s largest businesses have already moved out of Catalonia, which could greatly reduce potential tax income for what was one of Spain’s richest regions. The negotiations could also take a very long time, creating years of uncertainty. The Catalan independence movement has had a significant impact on the Spanish economy and could take a toll on the wider Eurozone economy if the uncertainty grows. In the interim, investors can expect to see the uncertainty manifest itself in reduced consumer spending and business investment, which could take a long-term toll on Spanish equities and potentially broader European companies that do business in Spain. International investors can insulate themselves from these risk factors by ensuring that their portfolio is properly diversified. In addition, investors may want to consider reducing exposure to Spanish equities until the uncertainty is resolved. Advanced investors may also want to consider hedging their exposure by short-selling Spanish exchange-traded funds (ETFs) or using put options to continue holding broader European ETFs without Spanish risk factors. What Are the Best Books to Learn About Global Investing? Should You Look at Sectors or Countries When Diversifying Abroad?